Amazon.in started New offer for their user with new method of competition. win Oneplus 3 Mobile on participating in Quiz. Just Download and Sign-in to the Amazon App. How to win a OnePlus 3 Phone? Once you have signed-in to the Amazon.in App, you can participate by navigating to the page where 3 (three) questions will be posted on each day of the Contest Period regarding OnePlus/ the Brand. The 3 (three) such questions will be posted on each day of the Contest Period at different time intervals commencing from 12:00 a.m. and ending on 10:00 a.m. Accordingly, the first question will be posted on each day of the Contest Period between 12:00 a.m. to 10:00 a.m., the second question will be posted between 10:00 a.m. to 5:00 p.m. and the third question will be posted between 5:00 p.m. to 12:00 a.m. Thereafter, if you answer correctly to the question at the first attempt and do not subsequently re-enter another answer to the same question, you will be entitled for a lucky draw which will be carried out amongst participants who have answered that particular question correctly. The draw of lots will be carried out during the Contest Period for each set of questions and 1 (one) participant will be selected as the winner by a random draw of lots for each set of question(s) on each day of the Contest Period. That is, a total of 12 (twelve) participants will be selected as winners for each question on each day of the Contest Period which will be announced at the end of the Contest Period. 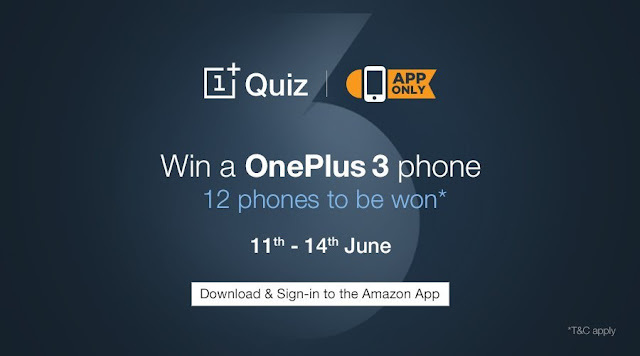 The OnePlus Quiz contest (“Contest”) is brought to you by OnePlus(“OnePlus”/ “Brand”) and made available to you by Amazon Seller Services Private Limited (“ASSPL”/ “Amazon”). Please read these terms and conditions (“T&Cs”) before entering the Contest. You agree that, by participating in this Contest, you will be bound by these T&Cs and you acknowledge that you satisfy all Contest eligibility requirements.